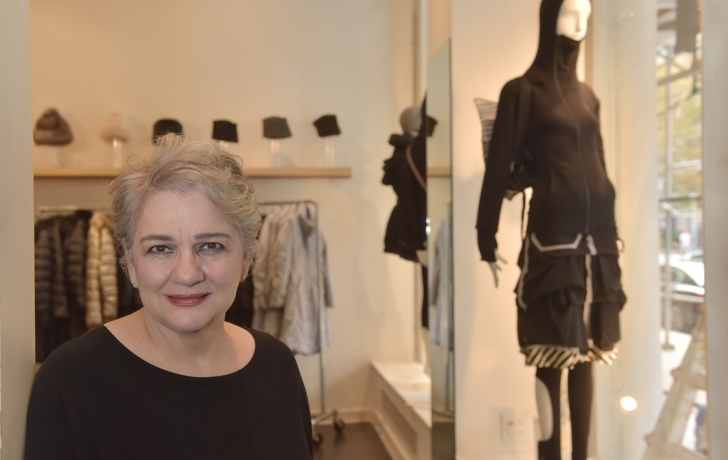 Ann Benedetto, owner of the women's clothing store, A Uno, in Tribeca, has never thought of herself as a rabble-rouser. But here she was, holding the stuff of a political organizer, a wad of recently acquired business cards in one hand, a bulging notebook of handouts and notes from meetings in the other. These days Benedetto is looking like a woman on a mission. "I'm a merchant," she said. "I have a store, I know how to dress women. This is not my skill set, so I'm learning as I go." What Benedetto has learned in just the last few weeks is that there are dozens of other store owners like her who worry about the survival of Tribeca's small businesses. Her job now is to recruit them into her newly minted organization, the Tribeca Alliance. So far, she is buoyed by the response. Thumbing through print-outs of recent emails she has received, she read some aloud. "I salute you," one of them says. "I will help you in whatever way I can," reads another. Times were different, said Benedetto, when she moved her store from Soho to the corner of West Broadway and Duane 14 years ago. "I thought it was the best business decision of my life." But now she sees a different retail landscape, where many of the businesses she knew are gone. "Bouley was across the street," she said, pointing to the Citibank that took its place. "That's the changing of Tribeca. I don't know if you can stop it, but…" she adds, her voice trailing off. But at the event, she met a representative from from the Manhattan Borough President's office, who had another idea. Why not start an organization? "That was not on my list of things to do," she recalled, but it got her thinking. A month later, she went to a Small Business Roundtable for Tribeca, organized by Manhattan Borough President Gale Brewer, where she heard other store owners complaints, many of which sounded unpleasantly familiar: Scaffolding that stayed up for months, even years, high taxes, exorbitant commercial rents, unfair leases, overzealous city inspectors. "That encouraged me," she said. "I realized that one voice is nothing. But a community voice can put pressure on government. That's when you can have some impact." In a follow-up meeting with representatives from the Borough President's office and the city's Small Business Services, Benedetto got a quick course in how to build her organization, set up a steering committee, find a monthly meetings space. (Since then, the owners of Antiqueria and Gymboree have offered their spaces for meetings.) She also heard about efforts by the office to help small businesses. Benedetto has since sent out a questionnaire to more than 70 local businesses, asking for ideas. Her goal is to see the "essence of Tribeca" preserved so that small owner-run businesses like hers won't be replaced by those that have, she says, "deep pockets and a big corporation behind them" and do not give the area "cache." Still, as the lone organizer and with a business to run, Benedetto knows the job ahead won't be easy. "It's up to me to keep the ball rolling," she noted. Last week, Benedetto got an email from the owner of a neighboring store who had heard about the Tribeca Alliance. "She said to me, 'Ann, that's a lofty idea and I don't know if it's going to work.'" "I'm going to go over right now and yell at her!" she declared. "How can you give up before you even start?" For more information, contact Ann Benedetto at tribecaalliance@gmail.